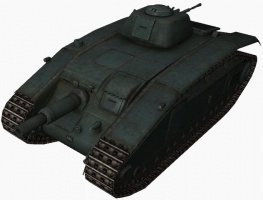 The ARL V39 is a French tier 6 tank destroyer. 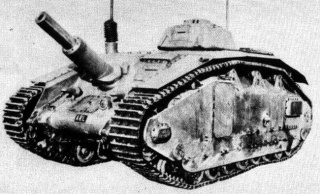 A prototype of the ARL 40. The vehicle was intended as an assault SPG. Mass production was to be launched in 1940 but never started due to the occupation of France. The ARL V39 is a drastic change from the S 35 CA. It is a victim of a general trend in the French tank destroyer line where deceptively good on-paper statistics are completely ruined by numerous drawbacks that are not immediately apparent in the garage. This can make it very frustrating to play compared to other tank destroyers. It does, however, boast a selection of powerful guns, and if left unhindered, it can deal a lot of damage in spite of its drawbacks. 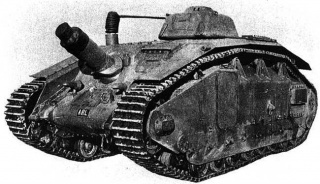 The ARL V39 leads to the AMX AC mle. 46. Powerful weapon selection, although each has drawbacks. Decent maximum speed, power/weight ratio, and acceleration. Third best view range of the Tier 6 tank destroyers (after the M18 Hellcat, M36 Jackson and Nashorn). Slightly more HP than the other Tier 6 tank destroyers. Poor gun dispersion values for a tank destroyer (except with the 90mm AC DCA 45). Absolutely useless stock gun with a horrible stock grind. Poor hull traverse and reverse speeds. Very narrow gun traverse arc. Also did not get +10 AP pen for its 105mm like the ARL 44 and AMX M4 45. Large size and poor camouflage rating . The ARL V39 generally works best at medium to long ranges, either providing second line support to the team or sniping at long ranges, depending on the gun of choice. The 90 mm DCA 45 provides outstanding penetration that is rivaled only by the Churchill Gun Carrier's 32-pounder gun, but at the cost of a low damage-per-minute value. 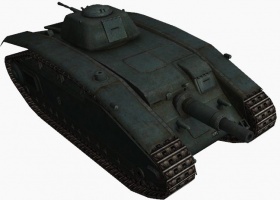 At 212 penetration, it is capable of defeating even Tier 8 heavy tanks at long ranges, with acceptable accuracy. The 105 mm gun trades the penetration and accuracy for much greater damage output, especially with APCR, and works best with an aggressive playstyle. Unfortunately, both guns are marred by poor gun dispersion values, and they cannot reliably hit and penetrate opponents without aiming, like most French tank guns. In terms of armor, there is nothing much to speak of. Any Tier 6, or even Tier 5, should have few problems penetrating it, and it is generally best to remain hidden to survive. 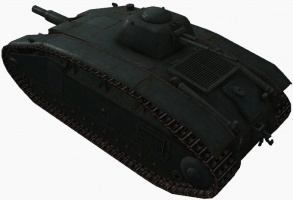 Special mention should be made about the absolutely useless machine gun turret on the top of the tank, whose only purpose is to allow enemies to hit the ARL V39 as it crests a hill before the ARL V39 can even hit back with its own gun. Hill-fighting is highly not recommended. Mobility-wise, the ARL V39 is nothing special either. It has enough to get where it needs to go (unlike the AT 8), but the disappointing hull traverse make it very vulnerable to getting flanked by fast tanks. It should be noted that the stock suspension cannot mount any other gun than the short 75 mm gun, and it is highly recommended that enough free XP be saved to buy the upgraded suspension immediately, or an equipment slot sacrificed for the enhanced suspension temporarily. Overall, the ARL V39 is a flawed tank destroyer that is not as easy to use as some of its competitors at Tier 6, but it does have some redeeming features. It is the last of the pre-World War II French tank destroyers in the line. The ER 53 radio carries over from the S-35 CA and can be installed immediately. The Canon de 105 mle. 1930 Schneider AC and 90 mm canon DCA 30 AC guns also carry over, but require additional weight capacity. The Renault T14 engine can be researched on the BDR G1B. Research the ARL V39 bis suspension first (consider using free experience to get it), as nothing else can be mounted without it and the stock gun is a joke at tier 6. Alternatively, use the enhanced suspension equipment. Next research the Renault T14 engine, if it has not already been researched. Finally, research the 90 mm DCA 45 AC. In the middle of 1935, France started the development of a new assault self propelled gun, and two companies responded with their suggestions. Somua (Société d'Outillage Usinage Mécanique et d'd 'Artillerie) started a project that was to become the Somua SAU S40, and ARL (Atelier de Construction de Rueil) developed the ARL 39V prototype. 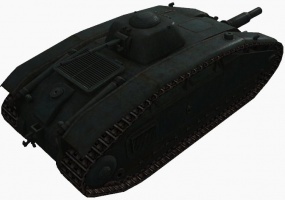 The ARL V39, also known as the ARL 1940 V939 or ARL 40, heavily relied on the parts developed for and used by the Char B1 tank. Its frontal armor had a maximum armor thickness of 50 mm. Its main armament was a 75 mm APX gun; a modification of the model 1922 de Casemate gun originally developed for destroying fortifications. The gun had a semi-automatic breech, automatic charging machine and a very odd feature; its main gun could be retracted inside the hull to decrease the vehicle length. 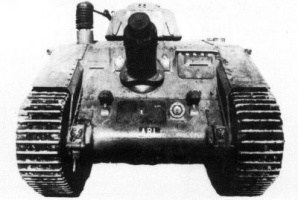 The ARL V39's secondary equipment consisted of a 7.5 mm machinegun placed in the small turret on the roof, which was similar to the competing Somua SAU-40 vehicle. The development was officially finished in 1938, and army field trials were conducted between 23 and 25 March, 1939. The French army was satisfied with the performance of the new vehicle, and approved the start of its serial production. The numbers vary from source to source, but apparently between 72 and 80 vehicles were ordered in the first series, together with 24 command vehicles. 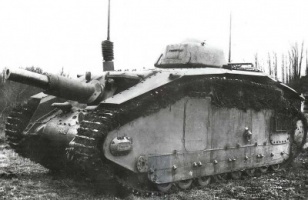 The fall of France stopped all production plans, and only two prototype vehicles were built. Both prototypes were evacuated to Morocco, but their fates remain a mystery. 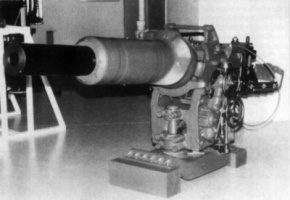 The ARL V39 was only armed with the stock 75 mm APX mle. 1938, and there exist no records of plans to arm it with any other guns. Touzin, Pierre (1979). Les véhicules blindés français, 1900–1944. France: EPA Editions. ISBN 2851200941. This page was last modified on 17 May 2018, at 19:00.